Vegas visitors looking for excitement will find that and more at Harrah’s Las Vegas in the heart of the Las Vegas Strip, where a festive atmosphere, diverse entertainment options and an action-packed casino permeate the property. The celebration starts outside the casino at Carnaval Court, a rollicking outdoor bar that features live bands and flair bartenders. Souvenir kiosks and food stands complete the street fair ambience. When entering the casino from Carnaval Court, a jester statue representing magic and jubilance ushers guests inside with the message: “The party has already started.” Nowhere is this more clear than just inside at the Piano Bar, where dueling pianos and karaoke keep the energy high. Harrah’s also boasts Numb Bar & Frozen Cocktails and the Signature Bar with color-changing lights, a crystal chandelier and big-screen TVs as well as 16 beers on tap. Chandeliers resembling large gold Mardi Gras beads decorate the expansive casino, which is always brimming with action. Gamblers delight in everything from a comfortable poker room to a stylish high-limit gaming area with sliding glass panels, a keno lounge and Rapid Roulette tables. Sports wagering is available in the race and sports book, called the Sports Pit, with high-definition televisions wherever the eye can see. Also in the casino is Toby Keith’s I Love This Party Pit, where dealers dressed in country-western garb sling cards while country music blares from speakers above. Those really feeling the honky-tonk vibe can head upstairs to Toby Keith’s I Love This Bar & Grill for a stiff drink, a bite and some dancing. With a number of unique restaurants, guests can enjoy succulent steaks, prime rib, seafood and chicken at Ruth’s Chris Steak. Flavors, The Buffet represents cuisines from around the world. At the 24-hour Fulton Street Food Hall, you can get everything from New York-style pizza, sushi, homemade soups and artisanal sandwiches to bakery-fresh pastries. Plus, cool and refreshing ice cream with added mix-ins like fresh fruit are available at Icepan. 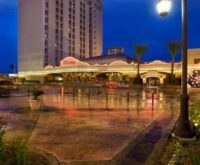 World-class entertainment at Harrah’s includes “Menopause The Musical” and the “Mac King Comedy Magic Show.”The hotel’s spa and Olympic-sized pool provide the perfect spots for guests to unwind. Harrah’s boasts 25,000 square feet of meeting space. The lobby houses several jewelry, apparel and souvenir shops as well as a shoe shine station. There’s also a health club with the all the latest cardiovascular equipment and weight machines. There is valet and self-parking. Guests will be charged $8 per day for self-parking and $13 per day for valet parking. Hourly self-parking and valet rates vary. Though located within easy walking distance to many other properties, Harrah’s is home to a Las Vegas Monorail station, making it a snap to go just about anywhere on the Strip. Plus, free shuttle rides are available every half hour between 10 a.m. and 1 p.m. to the Rio and Bally’s/Paris Las Vegas.